The northeast tip of Queens was once known as Willets Point after the family that purchased this peninsula in 1829. It was acquired by the army in 1857 with the purpose of protecting the city’s waterways from a foreign invasion. Capt. Robert E. Lee drew up the initial plans, which were then modified by the fort’s namesake, Chief Engineer Joseph G. Totten. Most of this former 150-acre base has been a public park since 2005, with the rest of the base divided between the Coast Guard, Fire Department, Police Department, and U. S. Army Reserve. I was “deployed” to Fort Totten in 2015, to organize the agency’s book collection and drafting historical signs. It was a scenic assignment where I could spend my lunch break exploring the fort and swimming in its pool while basking in the history all around me. 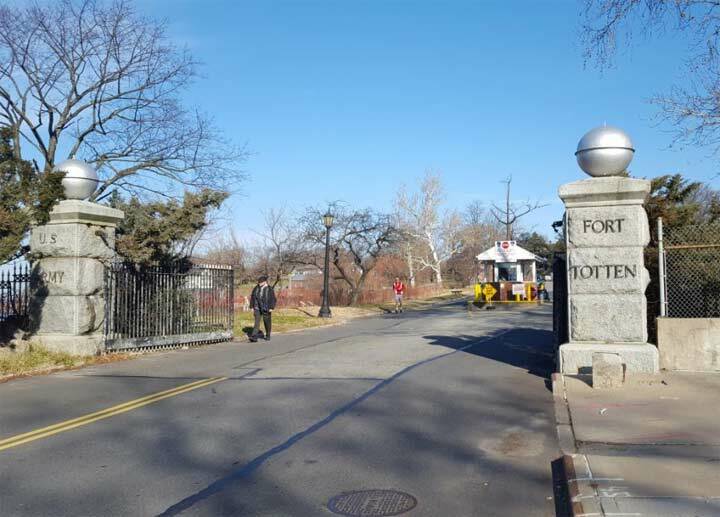 The entrance to Fort Totten is an ideal start for a tour. Atop the granite gateposts are balls that were either buoys or torpedo mines manufactured at this base during the Spanish-American War. 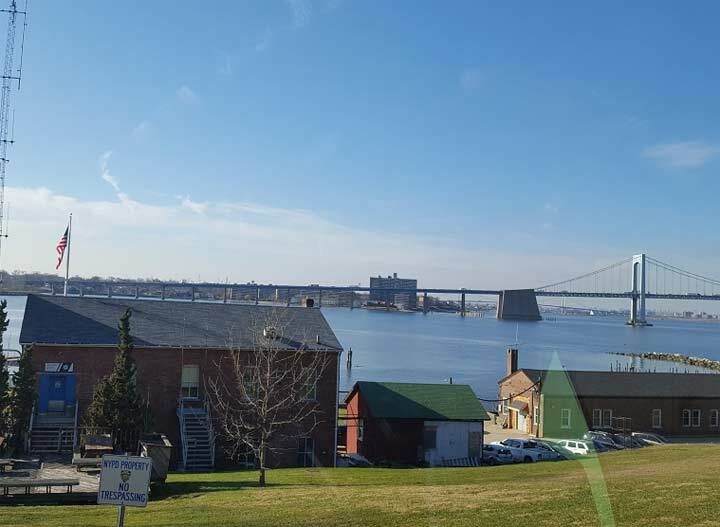 Looking towards the East River from the Coast Guard station one sees Throgs Neck Bridge and the Beechhurst neighborhood behind it. Under the bridge approach is the former Wildflower estate and to its left is Little Bay, whose crescent shoreline hints at a proposed beach that was never built. See the essay on Whitestone’s Far North for more details on this area. Along with public agencies, some of the buildings on the former base are leased to community nonprofits. 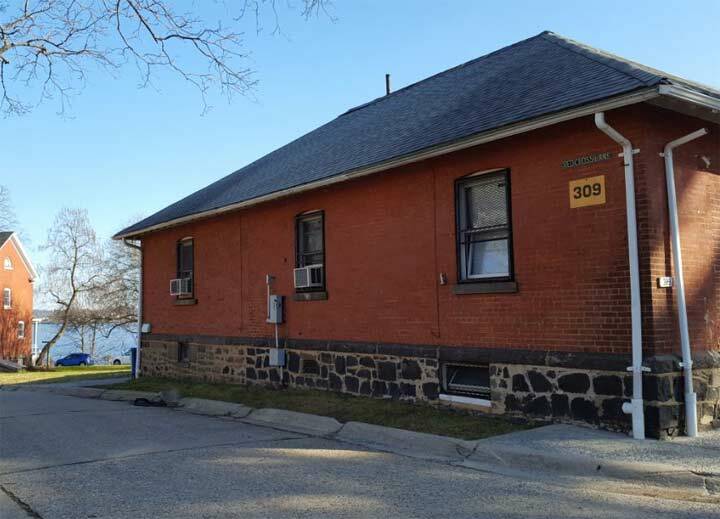 The former Officers Club is the proud home Bayside Historical Society. Completed in 1887 this “castle” initially served as the Officers’ Mess Hall and Club for the U.S. Army Corps of Engineers School of Application. Although the USACE relocated to Washington in 1902, the building’s outline appears as the logo of this agency. The Willett family has a long history in this region, as far back as 1643 when Richard Willetts was among the founders of Hempstead. The Parks sign for Willets Point Playground in nearby Whitestone tells the full story. The house overlooks the former ice pond, one of two ponds at Fort Totten. The pond is located within the army enclave, so it’s not accessible to the public. As for Sgt. Beer, according to the Paul Thomsen, archivist for the Society for Military History, he managed the arms depot at Fort Totten in the late 19th century. 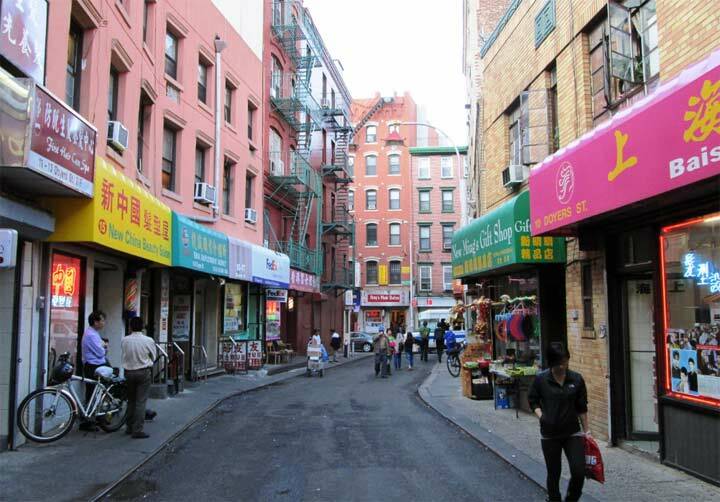 Forgotten-NY has a detailed list of NYC streets that carry full names of individuals. 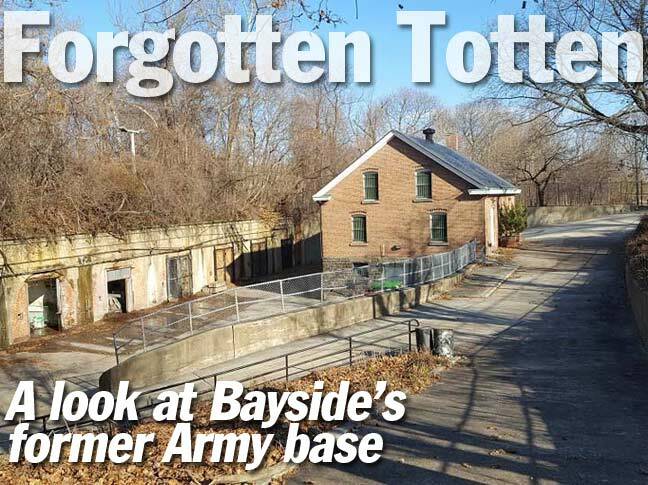 Every military base is like a small town and Fort Totten is no exception. It had a chapel, theater, and a YMCA that was built in 1926. This neo-Georgian building remains vacant but in 2012 Will Ellis of Abandoned NYC snuck inside to take photos. 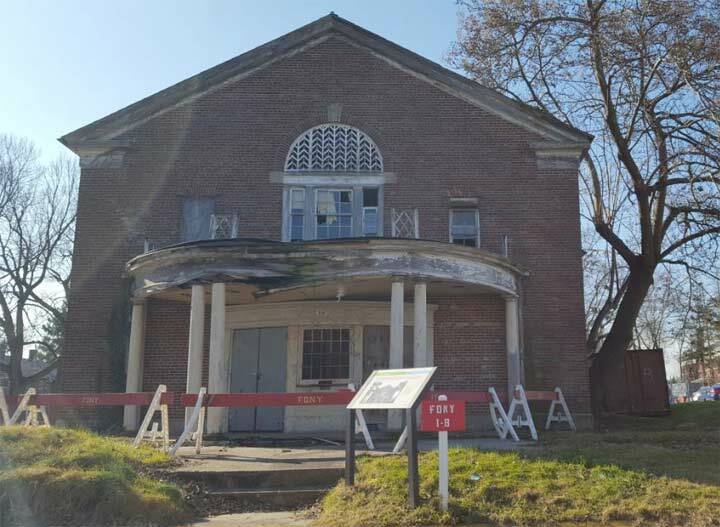 Fort Totten’s theater building has also seen better days. In its early years, servicemen had to follow the dress code to gain admittance to this theater. Both the YMCA and theater buildings have historical signs with photos that tell their stories. As Kevin noted in Oct. 2018, the base has its own set of streets with unique signs and lampposts. The FDNY has since painted over some of the names on the sign plates for their own reasons. 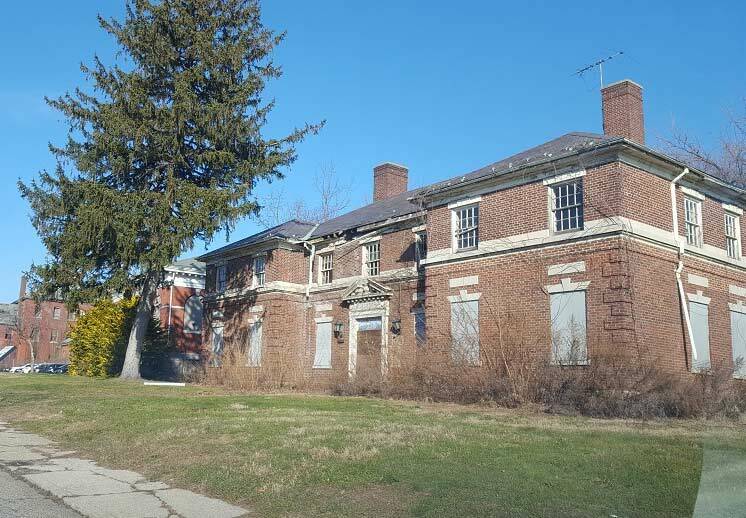 The homes at Fort Totten never had street addresses, they always had numerical designations such as Building 107 or Building 203. So in reality, the street names are useless for postage and directions. Across from the theater, Red Cross Lane is marked with a sign on a building wall, a rarity in this city. 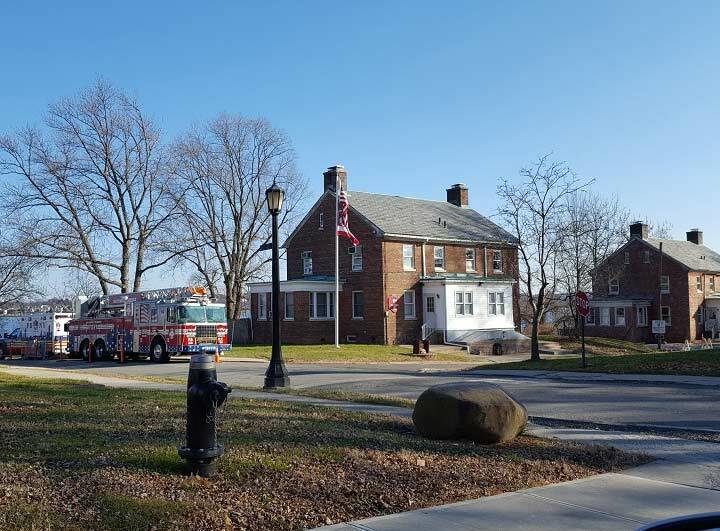 With the exception of the batteries, Willets Farmhouse, and Ernie Pyle USAR Center, most of the buildings on the base are Romanesque Revival. 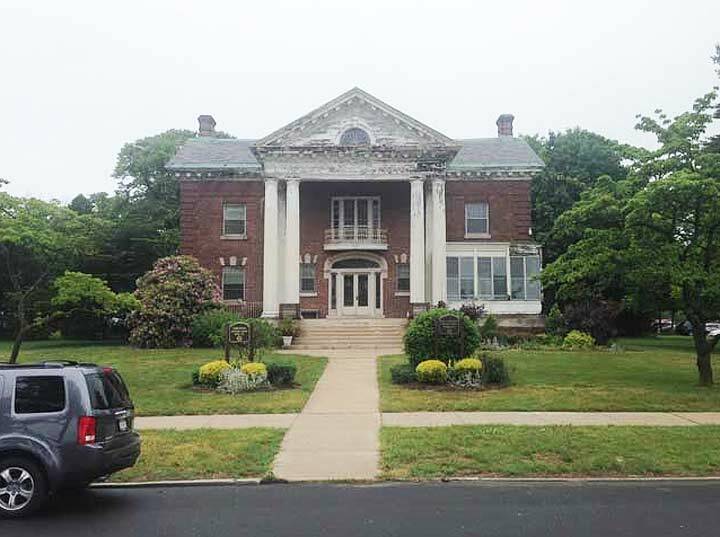 The 1999 Designation Report by the city’s Landmarks Preservation Commission has the full details on every building at the base. 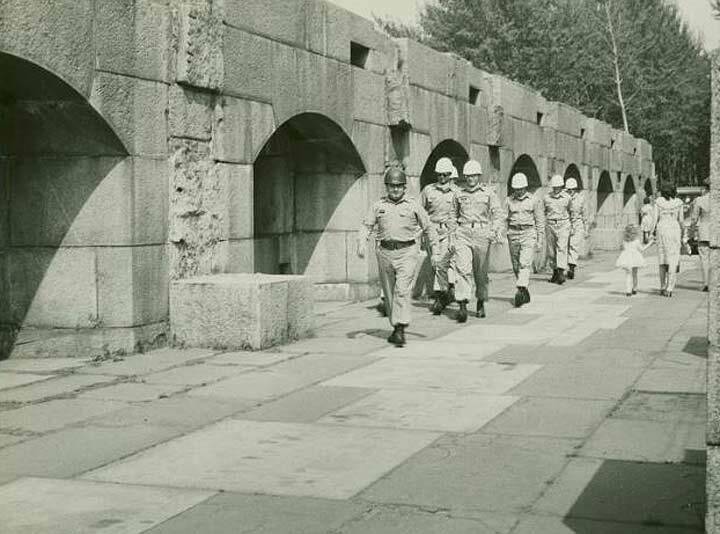 As with all military bases, Fort Totten has a Parade Ground that was used for muster. Within this field is the public pool and behind it, three former barracks, two of which are crumbling. Governors Island also has a pool of similar size but the city opted to leave it abandoned while restoring that base’s theater building. 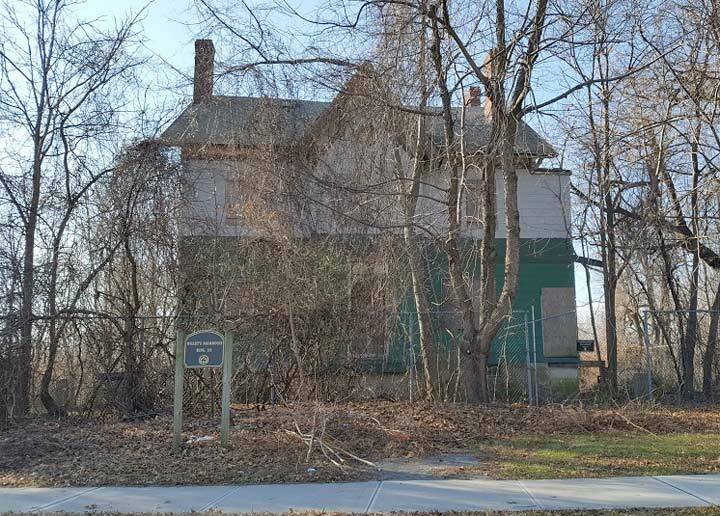 The Commanding Officer’s House, also known as Building 422 was completed in 1908 and serves at the headquarters of the northeast Queens region of NYC Parks. It certainly commands attention with a view of the Parade Ground at its center. The actual fortifications can be seen at the northern tip of the peninsula, which also has the park’s highest point at 68 feet. From here one can see the East River widening into the Long Island Sound. It is a very windy corner of Queens. I did not have time to take a tour of the actual fort, so here’s a Cold War period photo from Little Neck resident C. Manley DeBevoise, found in the NYPL Collection. Construction on this battery stopped in 1862 when it became clear that its design was obsolete and the high improbability of a Confederate assault. 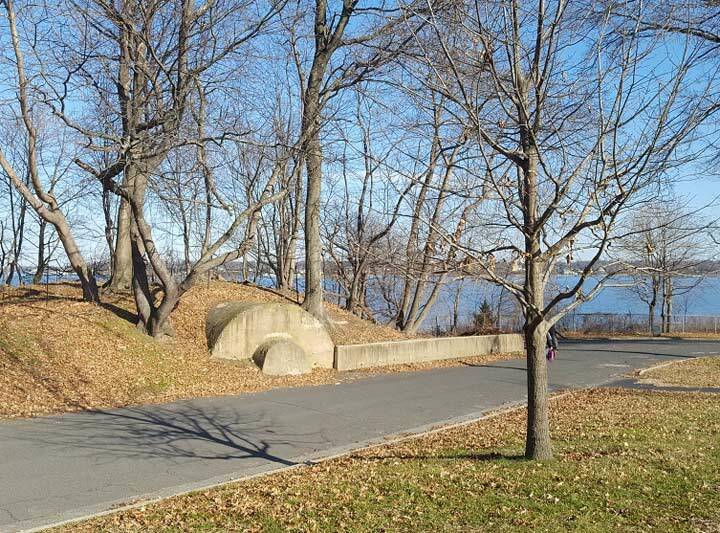 From that point on, the base was used for arms storage and training rather than actual defense of New York’s waterways. The fort was renamed after Totten in 1864, following his death. Born one year before George Washington was sworn in as President, Totten served this country in the War of 1812, the Mexican War, and the Civil War. One day before his death he was awarded the title Brevet Major General. Above the Water Battery are the Endicott batteries that were built in the last decade of the 19th century. But the Spanish and German invasions never came. These batteries were abandoned in 1938. The field facing these batteries was planted prior to 2005, when a dozen unremarkable residences were demolished in favor of more open space. 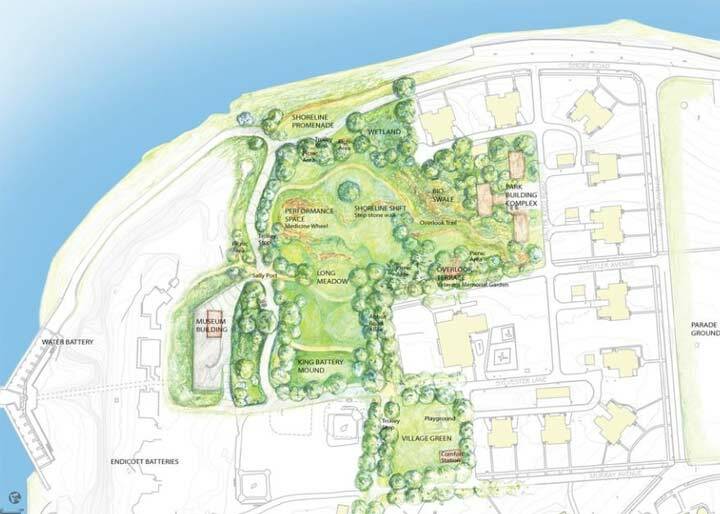 Designed by landscape architect Nancy Owens, this “park inside a park” features a hilly lawn, mounds covering up the ruins of King Battery, a playground, wetland, and picnic area. 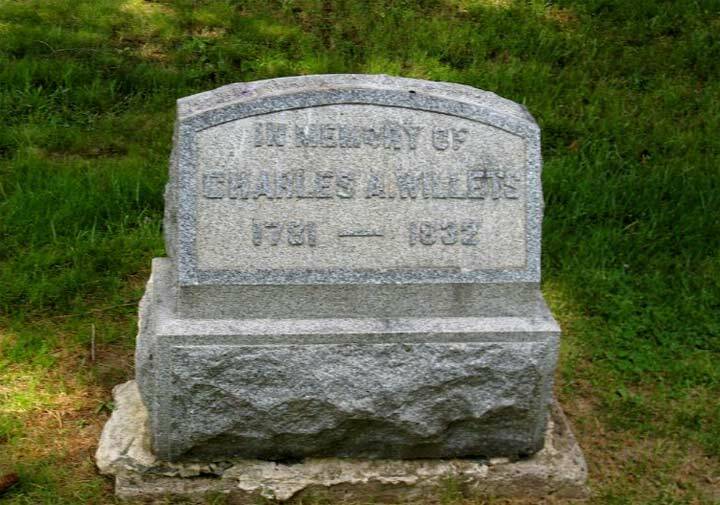 Charles Willets died in 1832 and was buried in a family plot on his property. Although his body was reinterred at Green-Wood Cemetery in 1855, this stone marker stands on the gravesites of the farm’s previous owners, the Thorne-Wilkins family, which claimed this property in 1645. 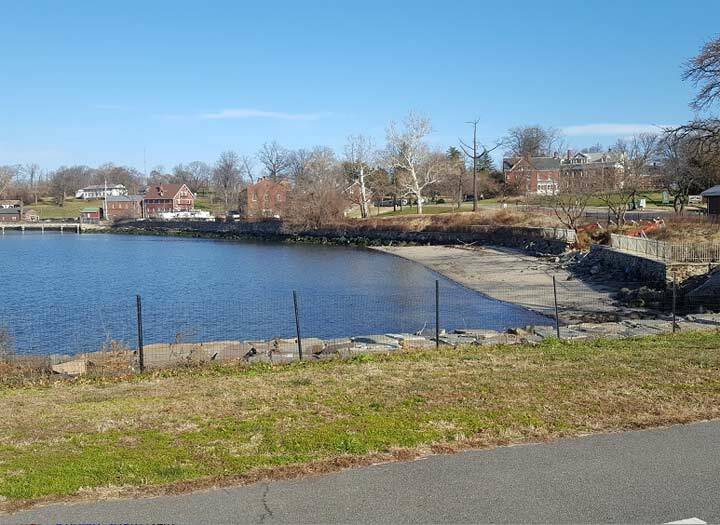 Leaving Fort Totten, one can rest on the beach or walk the jetty in Little Bay Park. Along the shore is a bike path that terminates at this park. This path is part of the Brooklyn-Queens Greenway, a 40-mile bike route that begins in Little Bay Park and ends on the Coney Island Boardwalk. Along the way, it runs through 13 parks, two botanical gardens, the New York Aquarium, the Brooklyn Museum, the New York Hall of Science, two environmental education centers, and four lakes. Arguably the city’s version of the Appalachian Trail as most of it runs through parkland rather than streets. For more details on the history of Fort Totten, check out the historical timeline at FortTotten.org. 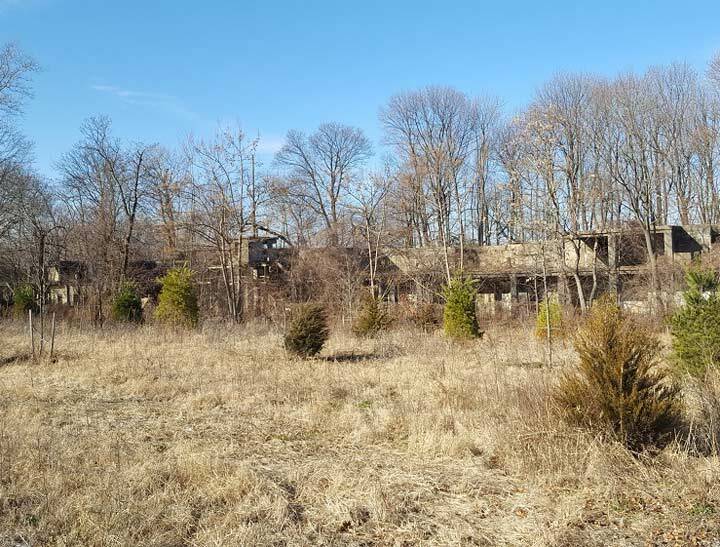 Forgotten-NY has been to most of the city’s historical forts, including Fort Tilden, Fort Schuyler, Fort George, Fort Hill, Fort Clinton, Fort Defiance, Fort Independence, Fort Tryon, Fort Greene, Fort Hamilton, and Castle Clinton. That’s a lot of forts since Kevin began his service to this city in 1999. Seriously, he’s been to quite a lot of former military bases considering that he never actually served in the military. As a former resident, I can tell you that the streets did matter as we had house numbers and street addresses.And I’m a little pissed that the city of NY is wasting these beautiful houses as office space for NYFD/NYPD. It’s a waste, when they could have turned it into a private housing community and made the city tons of money to benefit the community, including NYPD/NYFD. Private developers have been trying to get their hands on the post since the 1960s. The community won’t allow it. It would be a sacrilege. Those beautiful houses are in terrible shape, dangerous and not cost-effective. Our old house (#203) by the main gate has been used by the Parks Department as offices, and rather than repair the inside walls, they put up plastic sheeting with duct tape, allowing the roof leaks to ruin the building. Thank you for sharing this. My Uncle served here at some point till when he retired in 1970? Yes there are Youtube videos of going down under into the tunnels, and explaining how the mines on cables underground were used. Overtime the water did sink into the Fort, especially in the tunnel to Fort Schuyler. Have been in the Officers Club for parties, and to help out with events for Boy Scouts. Yes Sadly I wish some foundation or non profit would work on restoring some of the old homes. Sadly as a prank gone wrong, a few people snuck into the houses and got very ill from the mouse, rat and rodent issues, a few years back. Some people talk of giving spaces in the fort to Veterans but honestly the Fort Totten is a very damp place. building could be built to house the homeless Vets, I think it would be a great honor for them to stay. Instead of building roads and bridges in Afghanistan, the buildings built here would save countless lives, and give work to them also, giving them their pride back. But this is Just my opinion. There is but one tunnel on the post; from the Mine Assembly Building (now the Visitors Center) to the Water Fort. There was never a tunnel from Totten to Schuyler. Nothing was built, and nothing was even planned. I have copies of the plans, along with numerous maps and other documents. Then there’s the fact that the technology didn’t exist to build such a tunnel, and the Sound’s depth and steep grade would mean that a vehicle tunnel be very large, and very long. Other than the tunnel I mention above, the YouTube videos purporting to show tunnels on the fort are fake. Those are horizontal ventilation shafts in the (newer) ordnance magazine. No part of the Fort is below the low-tide line. There are no tombs on the post. The Capehart residences built in the 1950s were torn down due to their condition and asbestos issues. The older (ca. 1900) homes are in very rough shape. Remediation would be very VERY expensive. 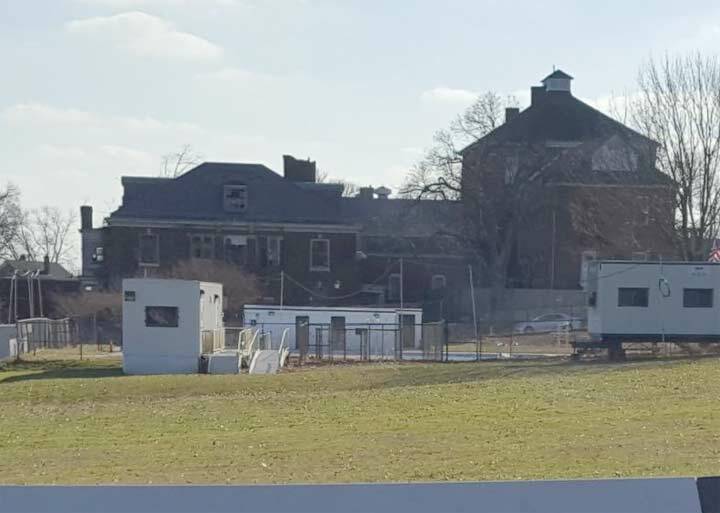 Perhaps the old barracks by the parade field MIGHT be candidates for remediation and conversion into homeless veterans residences, but the issue keeps going back to money. Why are so many residences left empty when there are numerous in need of housing! They’re in no condition for habitation. Many of them have roof leaks and structural issues. Vermin infestation and lead paint are also issues. I lived in two of those larger homes, and two of the now-demolished Capehart homes. In the larger residences, they had two 275-gallon oil tanks in the basement to feed the furnace. In a typical winter, we’d go through both tanks in one week. Truth. The design of the corp’s insignia is actually the other way around- the corps actually built castles along with forts, hence Castles Clinton and Williams in New York Harbor. The use of a castle as a symbol for the corps dates back to 1807, during the height of castle building in the defenses of the country’s harbors. The current design dates to 1840, a full 29 years before the school was built at the fort. The building at Fort Totten was built to resemble the corp’s symbol, but is not the inspiration for it. My family lived on Fort Totten from 1968-1981. During that time we lived at four locataions: 512 Abbott Rd, 407 Murray Ave, 203 Totten Ave, 420 Weaver Ave. I assure you every home had a street address, required for service by the US Postal Service. The post once had its own Post Office, but that job was taken over by the Flushing Post Office. 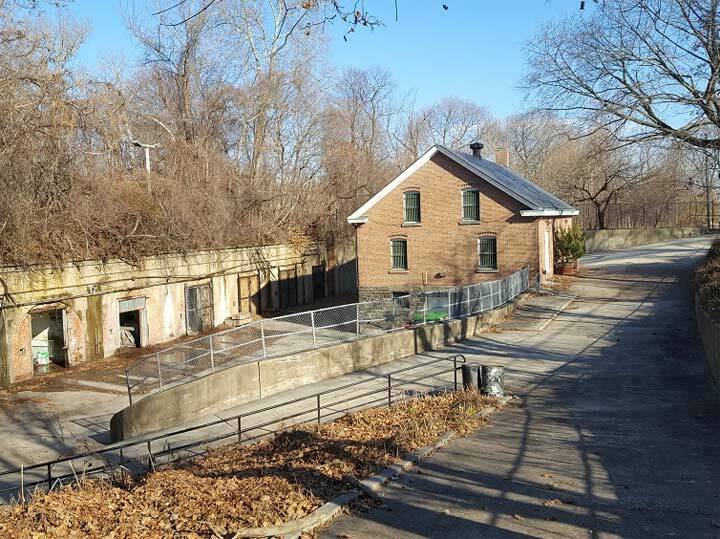 Today I run the Fort Totten website (Linked in this article. Thanks!) and Facebook group. Those are torpedo mines, not buoys, at the main gate. There’s only one tunnel on the property, from the Mine Assembly Building (now the Visitor’s Center) and the Water Fort. As you surmise, there was never a tunnel, planned or built, between Totten and Schuyler. 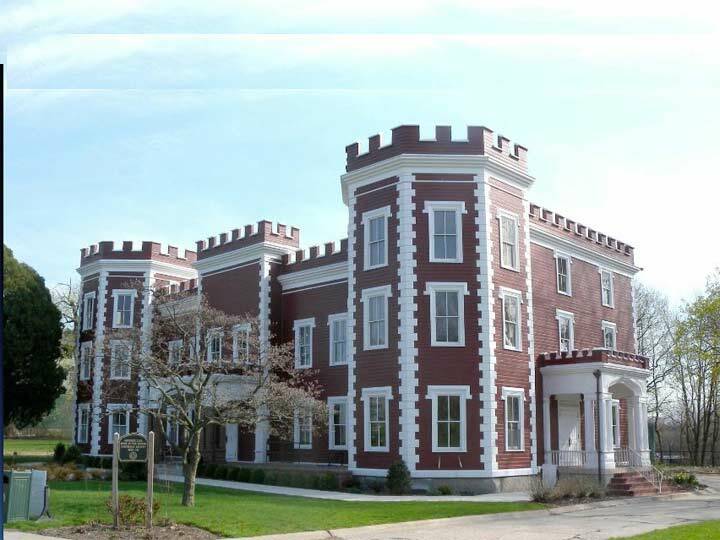 Although there was extensive use as a training and research facility, further development as a defensive fort continued well after the Civil War, with new armaments installed by the Endicott (1885) and Taft (1905) boards. 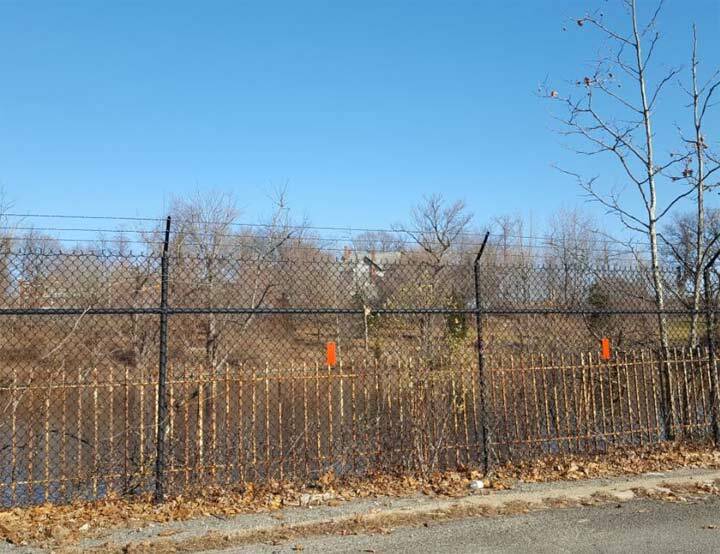 In the 1950s, Fort Totten was a regional Nike missile headquarters for the NY area. The actual missiles were located across the Sound, at Hart Island, while administrative offices and personnel housing were at Totten. Joseph Totten also invented the Totten Gate. These were steel doors that covered the opening in a fort’s walls through which cannon would fire. His design allowed the gates to automatically swing shut after firing so that nothing could be return-fired back into the opening and hitting the artillery crew..
My family lived at Ft.Totten68-70.My father was an air force recrewter at CastleHill ave.in the Bronx.I have all ways said,it was the nicest piece of real estate in NY.we live at134 Sgt .Beers ave.I work on a tugboat and just went by last week.it awakend a lot of great memories. Where would the families of soldiers lived on the the base in the 1860’s.my grandfather was born there. Would any of those structures still e it’s.